Never one to back away from a challenge, when my sister in-law propositioned that I try the best pizza in Guelph, Ontario, spurred on by my review of Pizza V’s (read about it here), I tenaciously accepted the invitation. That fearless acceptance of course had more to do with it being pizza than me being so ballsy – but nonetheless I was resolute in my consent. Situated in the heart of downtown, Buon Gusto is housed in the historic Victoria Hotel building. 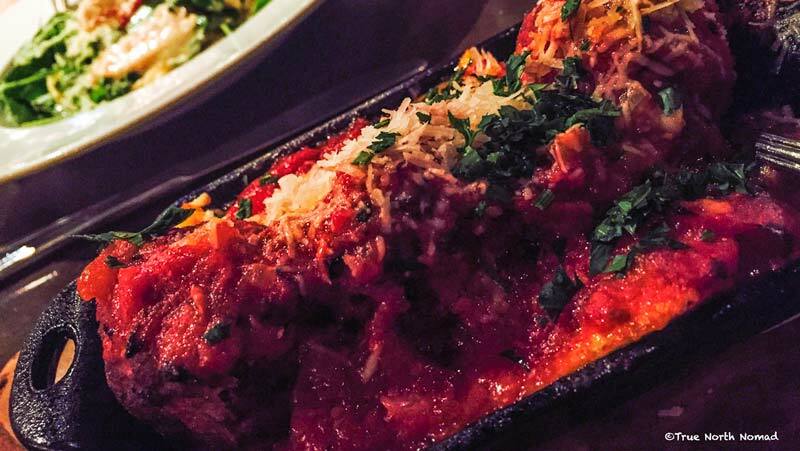 As advertised on their website here, Gusto (as I nicknamed it) is casual, contemporary dining of authentic Italian dishes using fresh, seasonal ingredients. Family recipes brought from their homeland, this restaurant is so serious about it’s Buon Gusto (“good taste” in Italian), they even had a wood-burning oven brought to Canada from Regello, Tuscany. Now that’s some dedication to authentication if you ask me. And although this was a challenge, we of course made sure my sister-in-law and brother came along, in addition to my sister and my brother-in-law who were celebrating their wedding anniversary. Sure, sneaky way to try to get a free dinner. Anyway, I was so “into” photographing and taking note of the food I never took one picture of us all together or individually for that matter. Ha – so much for the memories right. Well I intend on doing better next time – I promise family :)! Here then is our rating of Buon Gusto! The restaurant was packed on the Friday night we visited. Luckily we had made a reservation and were seated quickly. The hostess placed our group at a fantastic table, off to the side of the main restaurant and right near the kitchen. I know, you’re thinking “…near the kitchen”? How is that fantastic? Well the kitchen is open allowing you to peer at the hustle and bustle and we were within spitting distance of that wood-burning oven. Our waitress was attentive and knowledgeable about the menu items. She took good care of us and was quick to serve our drinks and food orders. I loved the vibe of this restaurant. The rocks of the old hotel are exposed as are the ceiling beams and rafters. At times it was a bit loud because voices reverberated off the stone floors and walls. The lighting was perfect – not too bright and not to dim. Among the historic and rustic features of the building, modern sophistication was splattered here and there via the chandeliers and art. The atmosphere was elegant without being snobbish. As I mentioned before I had to try everyone’s dish. I mean I just had too. For appetizers I sampled the Mushroom & Gorgonzola crostini, Wild Mushroom soup and Roasted Beet salad. The crostini and soup were delectable! I love mushrooms and any time I can get some good fungi I’m all over it. The beet salad was really good. It’s not really my thing but it was fresh and seasoned beautifully. For the main I sampled the Linguine Romantina, Toscano pizza and a meatball appetizer my brother-in-law had for his dinner. Let me start with the meatballs. Again, I’m not a huge meatball fan but they were delicious in a scrumptious red sauce. The linguine was set in a light, smooth cream sauce made of goat cheese instead of parmesan and it was friggin heaven! Yes I’ll be having that again. But of course you know I saved the best for last. The challenge was all about the pizza and I heard about this pizza oven for weeks leading up to this event. But could it tantalize my taste buds like Pizza V’s had done? Well let me start with the crust. The dough was almost like bread, tender and chewy it teased you at every bite. 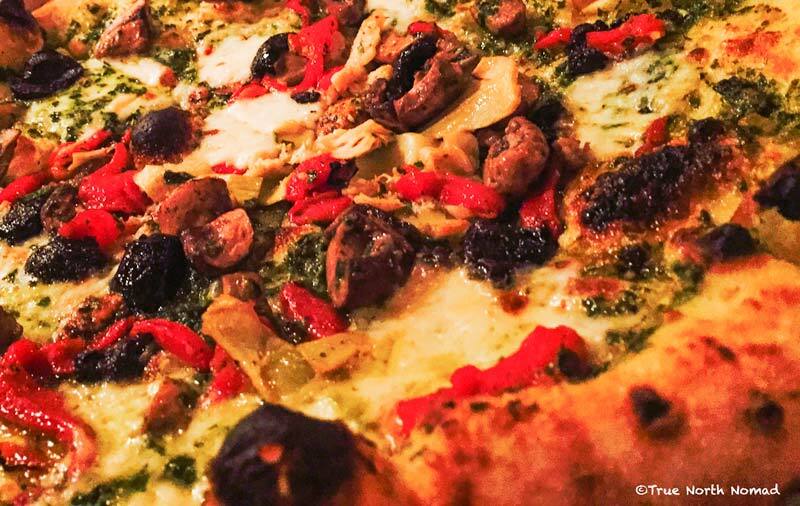 A more traditional pizza, the red sauce was replaced by pesto which was covered in salty olives, roasted peppers and an in-house made cheese – all drizzled with olive oil. Yep, pick your lower jaw up. 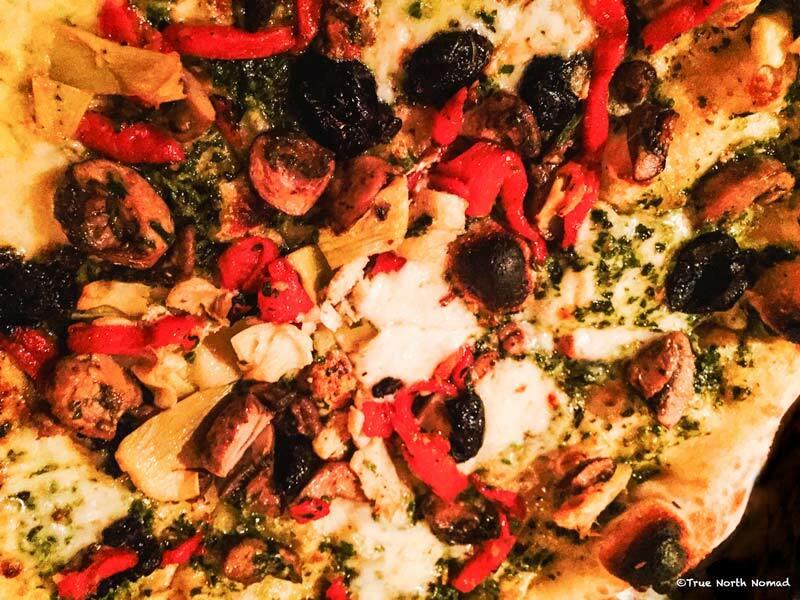 This pizza was the cat’s meow. It was perfect in any and every sense of the word. I loved it. It was the best food item by far. Now I know you’re asking, but was it better than V’s? Well here’s the thing – V’s pizza is a more traditional North American style while Gusto’s is more traditional Italian. It’s like asking do you like your left hand more than your right? Well I like both of them thank you very much and equally the same. They are just different variations of my one true love. And I’m ok with that. Both restaurants have their own unique place and time. With much gratitude we were treated to dinner. Thank you. But in reviewing the menu I didn’t find any item I thought was overly expensive. And considering the atmosphere you’d think you are going to pay through your nose, which you might if you were paying the tab for all six people, again thank you, but I believe Gusto’s prices were fair and modest for the setting and quality of food. Starting from the way our hostess led us about the restaurant till we found the perfect spot for our family’s night out, to the introduction of the specials and wine selection, the staff of Buon Gusto made me feel like it was important to them that I had a special evening. That was a nice touch. Staff was attentive and patient with our table as we flipped and flopped our way through the menu trying to decide what to order, not to mention the return trips to the bar. I loved Buon Gusto, and what the owner has done with it. Downtown Guelph is splendid all times of the year to wander and explore and our visit in summer was a perfect night. Inside, we found a large round dining table at the back near the kitchen with a line of sight to that massive oven. It was quieter than the rest of the restaurant which I enjoyed so as we could carry on our conversations without shouting or straining to hear anyone. I felt like I was at a good friend’s home sitting in their dining room and that might be the point of this table. 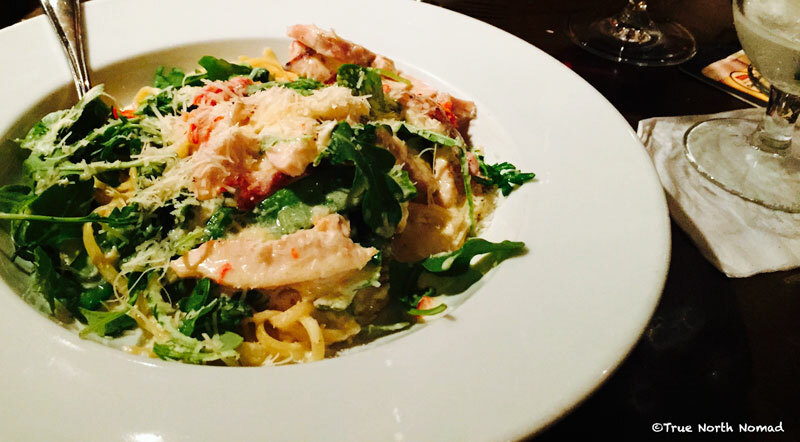 The atmosphere was warm and inviting and I loved every moment spent at Gusto’s. I tried the Mushroom & Gorgonzola crostini appetizer. 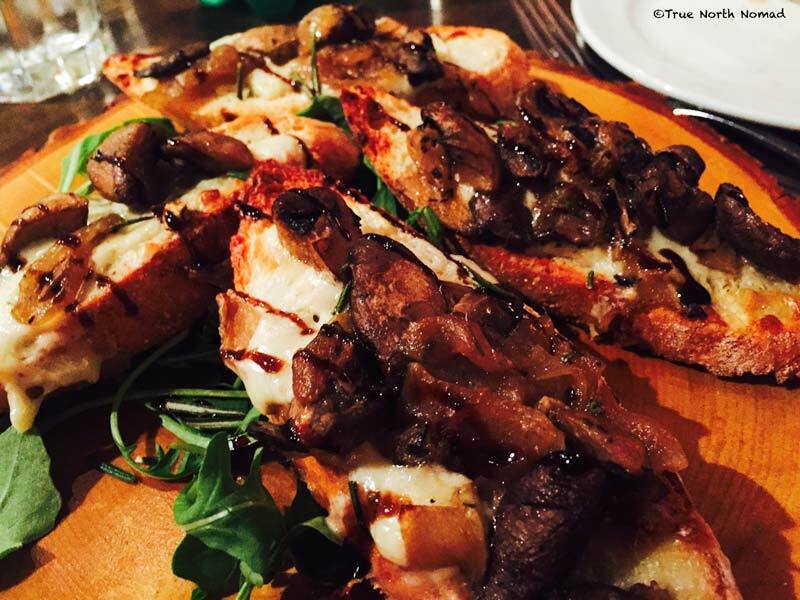 It was an abundance of fresh flavours on a warm piece of fresh, toasted bread! I could have eaten it as my main I enjoyed it so much. For dinner I had the Linguine Romantina and OMG! The cream sauce was just the right savoury creaminess and the grilled chicken was cooked to perfection (a claim often made but rarely achieved)! One word of warning, it is a very creamy dish and I loved it and would have it again, and even recommend it to my Mom. But if you’re not into white cream sauces it’s best to avoid this one as it might be too much for the novice cream foodie! From my recollection the meals were decently priced. And after the delicious dinner, I can certainly say there was value within the walls of Buon Gusto. Plus two of my favourite people picked up the whole check for the table. Can’t beat that. From Q’s and my review, you can see my sister-in-law not only knows me well, she has great taste in restaurants. 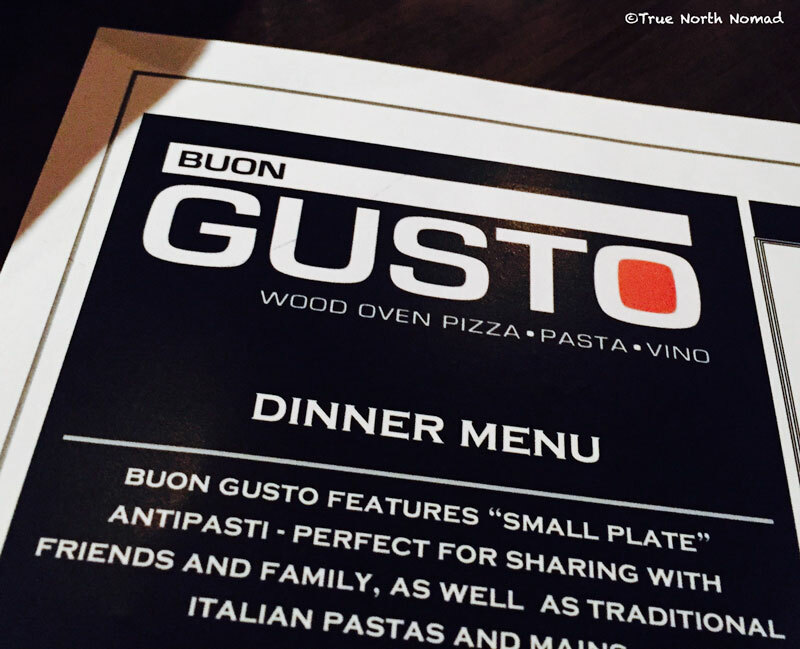 From a travelling foodie who loves to explore the culinary world as much as the natural one, I highly recommend Buon Gusto – it should be at the top of your dining list the next time you’re in the Guelph area. Capire? Do you have a suggestion for the True North Nomad to visit? Send us your prized foodie destinations! Mama mia…. mozzarella, portabella, manzanilla – enter your email address top left, bottom right or bottom centre of this post and click “Follow” and never miss an impassioned tale again!